Landing in Tokyo felt like a new beginning to our trip around the world. After living and volunteering in Cambodia for three months our trip had become less about adventure and more about integrating in a new place. We were now a few days removed from Cambodia after our stop in Shanghai and touchdown in Tokyo brought back the excitement of what was ahead. In Tokyo, we found a city that actually felt like home. Spring flowers were in bloom and the sweet smells of honeysuckle and rose met us along our walks. Trees and parks were hidden behind subway stations and tiny, inviting restaurants lined every block. We could drink water straight from the tap and didn't need to cover ourselves from head to toe in bug spray before going out. I hadn't realized how much I had missed California until we found ourselves somewhere so similar (actually almost identical in latitude). Yet it was also so different. Signs and menus were in Kanji and our inability to read anything became quickly apparent. We had to just smile as store clerks rapidly spoke to us in Japanese as we bought something, not understanding a single word that was said. Five thousand miles from California we found a city that allowed our old habits to resurface. We walked, and then walked some more. We had picnics in parks. We searched out a great coffee shop and the craft beer scene. We even tried a Chicago-style deep dish pizza. It felt good to have a taste of home. (Don't worry, we also got our fill of sushi and ramen too). A Chicago-style deep dish at Devil Craft in Tokyo. Our tiny studio apartment was in the Shimokitazawa area, a few stops from the famous Shibuya area but a world away from the hustle and bustle. Our apartment is the one right above me in this cottage. It was a peaceful spot contrasted by one of the world's largest street crossings at Shibuya Crossing - just a few subway stops away. Watch the madness yourself! The streets around our apartment were one-lane roads shared between walkers, bikers and small cars. Shops were quaint and restaurants allowed seating for only 10 or 20 people. It felt so safe, peaceful and inviting. Storefronts that were closed for the day let down their doors that were painted with colorful murals. One of the neighborhood shop's murals. 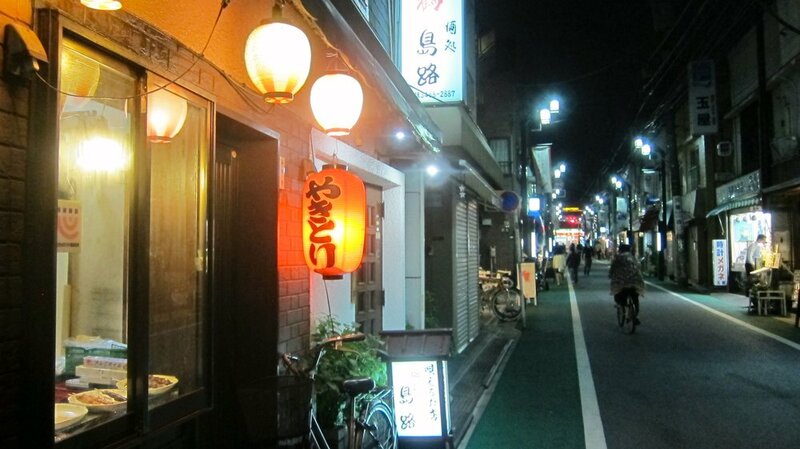 Izakaya's (drinking establishments that also serve food) lit their red lanterns at night up and down the small alleys. The tiny streets of Shimokitazawa at night. The girl in the apartment above ours practiced singing a song for two nights straight. Sometimes accompanied by music, but most often by herself. We are still humming the tune. We tucked into bed by 10 p.m. each night after wearing out our feet on the streets of Tokyo. It was good to feel at home.